In 2015 SAP made history when it launched its next generation ERP, SAP S/4HANA, based on the groundbreaking SAP HANA in-memory platform. Since then, more than 1,000 companies, of all sizes and across all industries, rely on it to run their core operations and to re-invent themselves for the digital age. 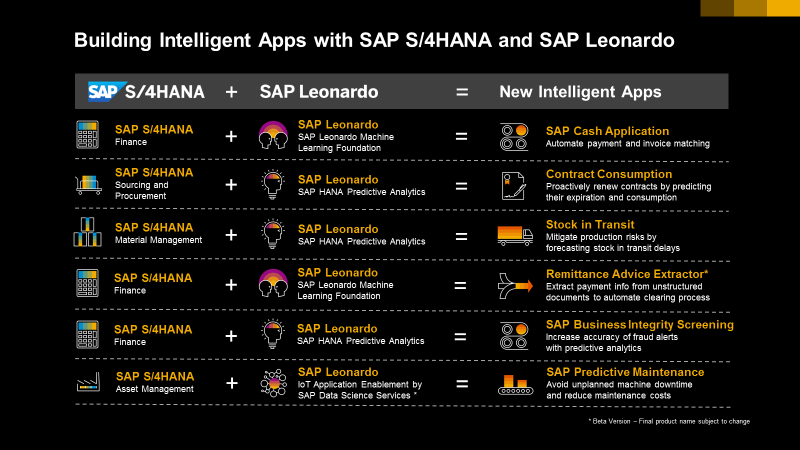 Today, with the launch of SAP Leonardo, organizations benefit from new applications that automate their business processes in an unprecedented way. The business value they get range from better decision making, improved total cost of ownership, diminution of risks, optimization of resources and more. If you think as S/4HANA being the digital brain of your company, new intelligent applications are the nerves, receiving data inputs in real-time, processing them, and feeding them back into the digital core to proceed with the business process they support. In this blog we’ll go through three use cases to illustrate how businesses are upping their game with an intelligent digital core. The first use case addresses the payment to invoice matching process that can be be an onerous manual task for accounting departments in order-to-cash organizations. Existing tailored rules achieve some level of automation but are costly to implement, and are not comprehensive enough, as many payments do not contain complete remittance information. A significant volume of payments still needs to be processed manually, for example if the payment contains no or incomplete invoice references, master data is not up-to-date or customers pay multiple invoices at once. The SAP Cash Application is a cloud application that automates the payment to invoice matching process. Bank statements that can’t be processed by the standard rules are forwarded to SAP Cash Application, along with open receivables in SAP S/4HANA, so the machine learning model can infer matching proposals. To train its machine learning algorithm, the application uses historical financial clearing information to capture a rich profile of customer- and country-specific behavior. With this new application, finance teams can focus on what drives their business, not administrative burdens. They are now able to support much larger workloads as their company grows. Our second use case addresses a recurring gap for companies issuing and receiving goods from and to their plants. In S/4HANA you can track your stock transport order with the Stock in Transit application. But what happens when you have delays? You have no insights into when your stock will arrive, and therefore can’t take proactive measures accordingly. Now, leveraging predictive analytics capabilities, the Stock in Transit application provides an overview of open shipments with their predicted delivery date, allowing users to take action and manage delivery delays, production scheduling, and other downstream activities. The application leverages machine learning so that results become more and more accurate as users retrain the model with historical data in SAP S/4HANA. Companies can now minimize cost outages and stock overages, better manage inventory costs and predict the shipment duration in days. In our third and last use case we explore the concept of predictive maintenance. As companies move from a reactive to a proactive approach to maintenance, the SAP Predictive Maintenance & Service solution identifies emerging issues to procuring spare parts, scheduling and executing maintenance. Based on advanced analytics and IoT services by SAP Leonardo the solution provides key performance indicators to monitor and manage equipment health. It enables business users to remotely monitor their equipment and leverage data science based analytics to alert them to deteriorating equipment conditions, perform root cause analysis and execute corrective actions in the logistics and maintenance execution systems. These capabilities can serve assets that are both owned and operated by companies as well as assets that are installed at a customer site and are covered by service contracts. For example this large train operator is already using this application to improve its maintenance processes and step up its customer service. Many more intelligent applications are made available with upcoming SAP S/4HANA releases, letting companies take full advantage of innovative capabitlies to re-imagine their business.